Happy Monday to you too. Looking forward to your posts. 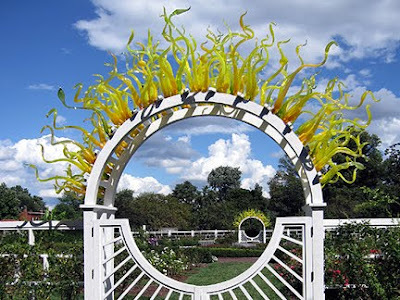 This looks like Chihuly has been through the rose garden at the MOBOT. Can't wait to see more. Glad to hear you made it home safe. That is one killer garden gate. You've been doing more traveling this spring & summer than the Travelocity Gnome. Glad you made it back home safely, Monica! I'm still in Oregon and daughter's internet just got hooked up, so I was hoping you might have posted some pictures of your trip. I thought it would be fun to see all my dead flowers on your blog:) Hope you had a great time! PS I like the bench in your previous post too! Monica, what a great teaser photo. Can't wait to see more of the Botanical Gardens. Such a fun visit from you and your friend. We all enjoyed seeing you and showing you our garden. The grands felt so grownup to be included and you were very gracious and kind to them. You have been missed, but you haven't missed us! ;-) Looking forward to your posts - though it'll take some organization, I think! What a busy traveler you are this Summer! You are certainly getting about this summer Monica :) Looking forward to hearing about your adventures and meetings with fellow bloggers. Lucky you, to be able to see all those gardens, especially the ones we've come to know & love through their gardener's blogs. I'm looking forward to seeing your perspective of them. Monica, I'll bet your title is music to Fiona's and James' ears! Glad you had a good trip - looking forward to seeing more! I know that's Chihuly's work!! He is a amazing....Boy what he could do in my garden!! Oh that Chihuly glass art, I cannot get enough of it! Lucky you, getting to see it for real!